The Empire Strikes Back is not my favorite of the original three Star Wars movies. The ‘new hope’ of the first film seems to dissipate. Even though the Death Star had been destroyed, the Imperial Troops of the Empire have driven the rebels from their base and sent them fleeing across the galaxy. The New Hope has vanished, the rebels hiding on an ice planet, and unable to stay more than 2 steps ahead of the Empire. By the end of the movie, the base has been destroyed, Luke has discovered bad news about just who, exactly, his birth father is, and everyone who isn’t frozen in carbonite is on the run. As the droid R2D2 would say, the odds of hope’s survival are 725 to 1. I don’t know about you, but lately things have felt like the middle movie of a trilogy. We aren’t in the new place of excitement. We haven’t reached the conclusion. We’re stuck in the muddled middle. Last week I was sad about gun violence. And this week, I’m even sadder. More people gunned down, the deadliest shooting since Sandy Hook, an anniversary we’ll mark next week. The time when we decided the murder of children was a price we were willing to pay to have untrammeled gun rights. We’ve had more mass shootings in 2015, in which 4 or more people were shot, than we’ve had days in 2015. It’s not a rousing endorsement of humanity, that description of us being like grass. But you look at the news, and we see people mown down like grass. We see people treating other people as if they are not even as valuable as the flowers of the field. The Empire has struck back and people are dying in a pandemic of violence, war, and homelessness. The city of Boise cleared people out of Cooper Court, the homeless tent city that was growing behind the Interfaith Shelter, on Friday. There are good reasons for not having people just set up tents in any public alley. It is too cold in the winter to live in a tent. It is not safe. Yet we can’t just discard the people who won’t move into the shelters. It is not an easy situation, for sure. Many people don’t want to be separated from spouses to go into men or women only shelters. Many don’t want to be separated from their dogs to go into pet-free shelters. Many people have substance abuse issues and in the midst of their addictions, won’t go into drug-free shelters. I sympathize with the city to a point. And if they hadn’t blocked off other areas where homeless were living, they might be finding more sympathy now. We just can’t discard people like grass clippings, or criminalize people for being homeless, or for having untreated mental health issues. How are we going to house homeless? Not just put them in shelters or tent cities? I don’t have the answer, but the enormity of the problem doesn’t mean we can ignore it. When people feel like pawns in a system that is bigger than their control, unable to get out of the mess, it feels like the Empire has Struck Back. And when Israel was dealing with exile, when the Empire had struck and carted them off, God said, “comfort, comfort ye, my people”. They are instructed to build a highway for God. To clear a path in the wilderness, making straight a desert highway for their God. God will come to them. They need to prepare the way. The divine voice doesn’t pretend it won’t be hard work. Someone shared some pictures, recently, of the highways being built in Los Angeles in the 40s and 50s. 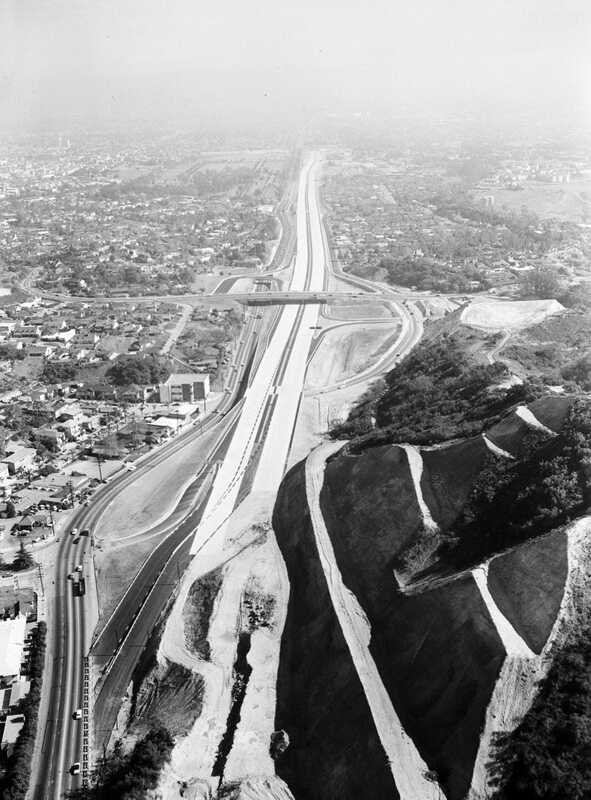 And just in case you think building highways is easy work, just consider what went in to widening Sepulveda Canyon. 13 million cubic yards of mountain were removed in order to widen the canyon. 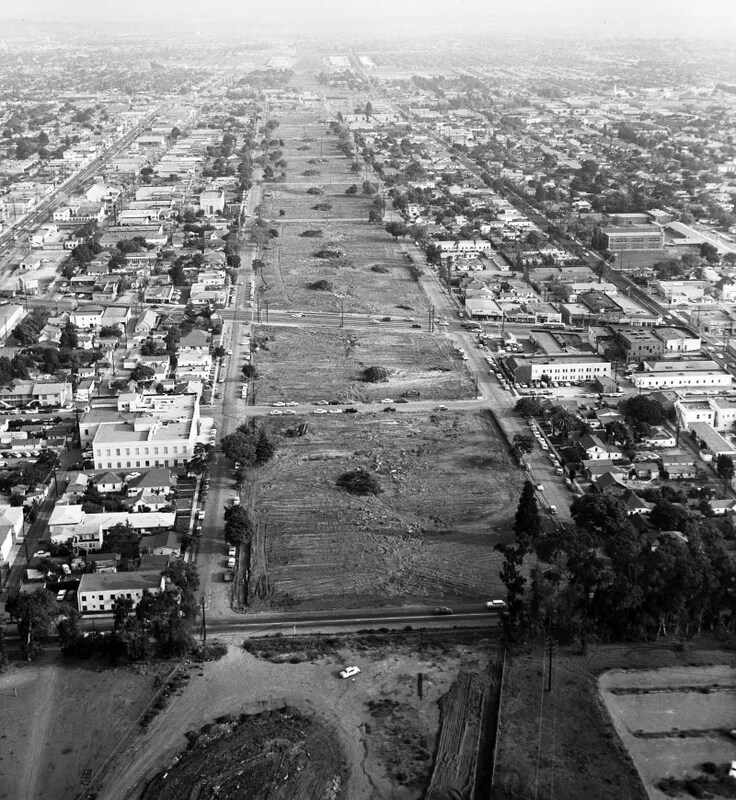 Scars were cut through neighborhoods as houses and businesses were bulldozed to make way for the highway. Here’s the link to the article so you can see the rest of the pictures. It really made me reconsider how much work is involved in preparing a highway for our God. And sometimes the enormity of the task leaves us ready to despair. The Empire is big. It is strong. It puts lots of money in the pockets of politicians. Who are we, members of a smallish congregation in Boise, to build a highway for our God, with our spoons, sandbox toys, and other building implements that don’t seem quite up to the task? In the Empire Strikes Back movie, after the rebel base is destroyed, Luke Skywalker heads to the Dagoba system to learn from the Jedi Master Yoda. His fighter plane crashes into a swamp when he lands. In this scene, Yoda is telling Luke to use the Force to lift the fighter plane out of the swamp. The crisis facing the Hebrew people in exile, the scourge of violence in our country today, the global refugee crisis, the growing problems of climate change—pick an issue—any of them seem like 13 million cubic yards of mountain standing in our way. Prepare the way of the Lord, we are told. Make straight in the desert a highway for our God. We can be like Isaiah and point out that people are like grass and what could we possibly do in the face of the Empire? But notice God’s answer to Isaiah. Friends, now is the time to let the world know of God’s love. The world needs to hear us preach God’s message. Comfort. Comfort ye, my people. The world needs to unlearn what it has learned. The Empire will not win. God’s word is what will stand forever. As we prepare our hearts and minds for the advent of Christmas, we take seriously the work of preparing a better world as a highway in the wilderness for our God. The Empire may have Struck Back, but they too are like grass, which fades and like flowers, which wither. The Empire does not have the last say. It is the word of the Lord which will stand forever. Let us do our part to prepare the way. 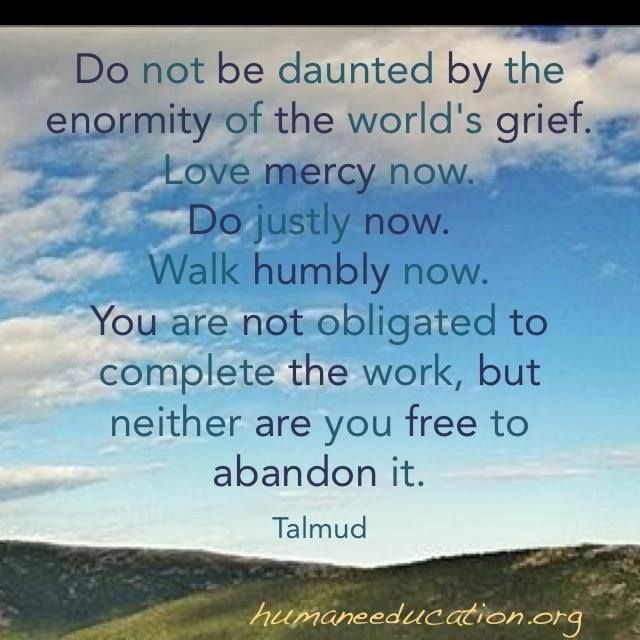 I think that’s Pirkei Avot — I have it on my desktop background. It’s an important reminder.